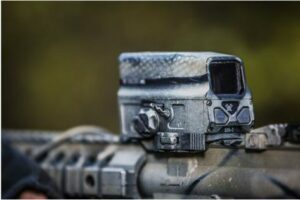 Vortex Optics have revealed a sneak peek of their Razor® AMG® UH-1. Code-named Huey, this holographic piece of technology is weapon mountable, and on the right is the first picture publicly released. The Razor AMG UH-1 sight consists of an aluminium chassis and features far fewer moving parts when compared to more traditional holographic sights. This makes for a more durable piece of technology. Power comes from the included CR123A battery, but can also be from running LFP CR123A’s. What I really like, is how these can be recharged on-board, through the use of the waterproof micro-USB port that can be found on-board. What makes this sight stand out even more, is that there is virtually no forward signature meaning the shooter is the only one to see the new EBR-CQB reticle. This is unlike any other holographic or red dot sight on the market. Keep your eyes on this page for more updates on launch dates, pricing, where to buy and reviews on the Vortex Razor AMG UH-1. Neither the pricing or the launch date is yet to be confirmed by Vortex Optics, but the rumours doing the rounds suggests a price of $499 and a launch date in January 2017.